Our business and web site is for all people who love travelling on wheels and searching for best services and products to suit their needs. 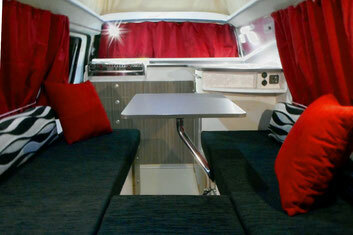 Our focus and work is dedicated to RV's such as campervans, build-in motorhomes and C class motorhomes. Looking for a used Southern Spirit Campervan? This van travelled only 21.000km and was converted in 02/2018 - we looking for a new home for it as the owner just passed away. This Southern Spirit Hiace has all the extras you looking for. Travels 4 and sleeps 2 - its a Hybrid between a Campino Classic and Quattro. Automatic Diesel- new price would be $78.000- grab a bargain for $66.000. Has solar, hot water, TV, bull bar, two bar, awning and much more. Be fast- rare to find- like brand new inside! We offer solutions to fit everyone's budget- from small extra ad ons to complete jobs - feel free to contact us. 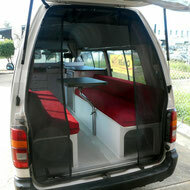 Our latest design is the all new Campino Camper- a versatile camper which you can make your own by customization. Built to high standards. the Campino is great value for money. Well received and reviewed by RV Magazines and happy customers. 2018 Toyota Hiaces are available from us- either as Campino Campers, but also for real one - off custom builds. Contact us to get best Drive Away price today. Visit our new created website www.campinocamper.com. For all people interested into a compact camper on a very well set price, starting Drive Away from $61.990. Explore the Campino Homepage- you can check prices with a real-time calculator or download the specification list.